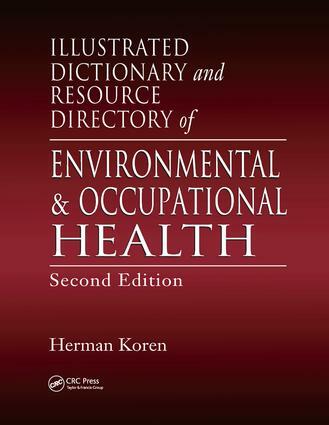 The Illustrated Dictionary and Resource Directory of Environmental and Occupational Health, Second Edition is a one-of-a-kind, comprehensive reference source for the vast and diverse collection of interrelated terms and topics that encompass the fields of environmental science, occupational health and safety, and preventive medicine. These topics include: epidemiology, energy; biological, chemical, and physical hazards; hazard analysis; microbiology; weather; geology and geography; food protection, food borne disease, and food technology; emerging diseases; pesticides; indoor air pollution; air quality; solid and hazardous waste; water quality; water pollution; sewage; bioterrorism; instrumentation; toxicology; risk assessment, statistics; computer science; GIS, mapping, and instrumentation; regulating agencies; and environmental law. This second edition of 16,000 terms reflects the steady evolution of the multi-disciplinary field including over 8500 new terms, related to equipment and environmental control, new and emerging diseases, hazardous chemicals, bioterrorism and emergency response, and environmental resources. This is an indispensable resource for individuals throughout the environmental, occupational, and public health industries, from students and environmental practitioners, to engineers, doctors, policymakers, and civic and professional organization members. "Definitions are easy to read and expanded entries are provided for many of the items. … A comprehensive publication that focuses on all aspects of environmental health, this dictionary will appeal to students and practitioners in areas related to the environment, occupational health, medicine, law, engineering, and related fields. This volume is recommended for academic and special libraries serving all fields of environmental and health studies, as well as public libraries." "Until I methodically proceeded through this dictionary, I confess that I really did not appreciate the enormous breadth of the field of practice and the underlying and supporting sciences…I was virtually spellbound over how encompassing and exciting this field of science actually is…"
Examples of new terms include: Endocrine Disrupters. Infectious Microbes and Chronic Disease. Environmental indicator, Adenovirus, Aldoxycarb, Carbofurin, Concentration Factor, Hemorrhagic Fever. Pheromones. Methyl Bromide. Acid Rain. North American Emergency Response Guidebook. Principles of Biosafety. Mobile Source Control Program. Geographic Information Systems. Chemical Hazards in Water.